Madison, Wis. (July 18, 2016) — Beginning today southern India native, materials scientist and Ph.D. student Ravindra Kempaiah (32), will be attempting to ride 5,000 miles across the country on a Stromer e-bike with a BodyFloat isolation system. Ravi departed from his mentor’s store Crazy Lenny’s E-Bikes in Madison, Wisconsin, this morning and will be finishing his journey at Stromer’s headquarters in San Diego, California, in mid-August. Be sure to look for Ravi and his Stromer bike during the next month. Follow along on Kempaiah’s journey: Check out his blog and Facebook page to see posts and updates on the ride and his whereabouts. 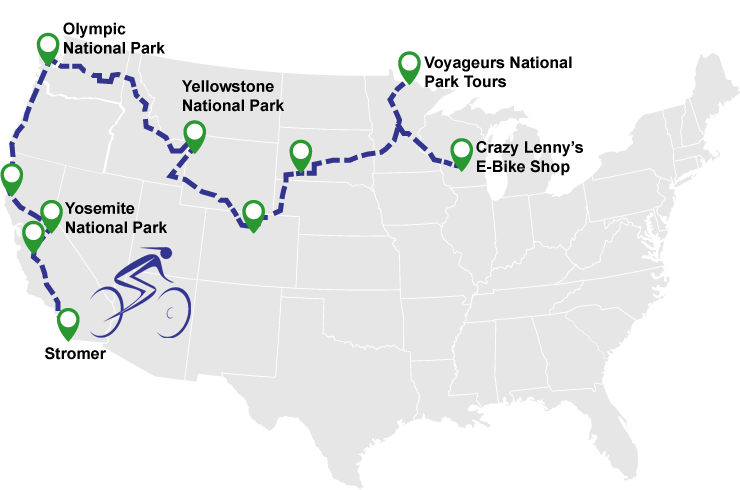 About BodyFloat: Cirrus Cycles is proud to support (Ravi...and Crazy Lenny’s E-Bikes) on their mission to set an new Guinness World Record of5,000 miles on an e-bike. BodyFloat Technology will help Ravi ride further, with more comfort and less fatigue while optimizing the amazing technology and power of the Stromer ST2. Ravi is helping spread the word that E-bike's offer new and amazing opportunities to literally any rider out there, from beginner to pro, from race to beach. Riders from around the globe, of all abilities, are taking note that the electric bike is a wide open opportunity to ride new roads, put in more miles and have more fun on any curve that lies ahead. Good luck Ravi...we'll see you on the road! Cirrus Cycles's BodyFloat Isolation Systems help optimize the riding experience of any rider...on any bike. BodyFloat offers the comfort benefits of suspension effectively paired with the improved performance characteristics of a controllable and proper connection. An efficient connection between bike and rider allows a rider to go further, more comfortably and with more power to best accentuates the technology of the bike being ridden. Road surface vibrations, small bumps and cracks on the road are virtually eliminated and more importantly, the body maintains a stable, smooth output. As the miles pass under the tires, energy is passed through the bike and into the rider, BodyFloat's unique design features is the gold standard of tunable vertical compliance and best isolates a rider from all these energies...and creates a feeling and connection with your bike that is something to experience.